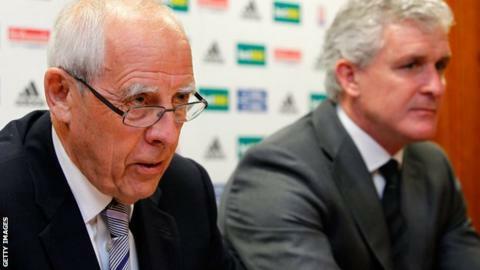 Stoke City chairman Peter Coates has been fined £5,000 for accusing referees of "bias towards other teams". Coates was upset with the officiating in successive home games against Swansea, Southampton and West Ham. The Football Association ruled that his comments, made to local media, brought the game into disrepute and found him guilty of improper conduct. The 76-year-old Coates, who contested the charge, was also ordered to pay the costs of the independent hearing.